Ocean travel upon a first-class vessel is more safe than is land travel upon a fast express. The Bureau of Navigation of the Department of Commerce and Labor at Washington will supply interested persons with copies of the “Navigation Laws of the United States" and with the recent act adding thereto. It is hardly necessary for us to enter into a discussion of these laws and regulations here, although some of them relate to such sanitary matters as the cubic capacity per passenger, etc. There are well-defined east and west steamer “lanes” upon the oceans, and sailing vessels have other courses laid out for them. This reduces danger from collision. The quadruple expansion engine and the turbine type of engine, as well as twin screws, made possible larger vessels, and it seems the larger they are the safer they are. Practically all vessels are now constructed with compartment bulkheads operated by a pneumatic mechanism, and it takes a fearful destruction of the hull to sink a ship so provided and in which the crew maintains discipline. The wireless telegraph has demonstrated its value aboard ship and particularly so as a means in procuring help in time of disaster. Rocks and shoals are indicated by lighthouses, buoys, siren", bells, and more particularly by the submarine bell. The sound from the latter reaches the ear of the man in the wheelhouse by telephones placed below the water line. Fire and fog are still terrors of the sea, but the dangers of both are being overcome. The tube fire detector will indicate even the smoking of a cigar in the hold of the vessel. The destruction of derelicts, the lifesaving stations, rockets, and other signaling devices, good lifeboats, life preservers, careful drill and discipline and elaborate government inspection all tend toward safety aboard ship. The Cosmopolitan for July 1909, contains an interesting article upon this subject by John Robinson Binns. An abundant supply of salt water for flushing purposes. Ample ventilation natural or artificial; auction preferred so that the ail' is changed completely every two or three minutes. This causes a current of air to flow towards these parts of the vessel, and the fans or ventilators, being placed as high up as possible, discharge the foul air clear of passengers' and living rooms. 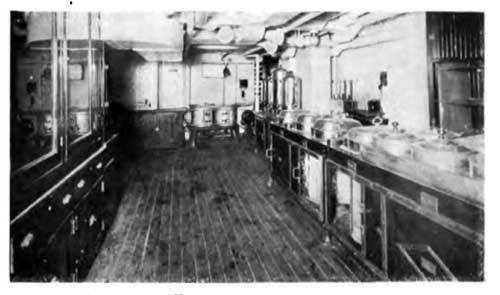 Separate ventilation of soil pipes by pipes led through ship's side. Owing to the Oriental trade the vessels plying upon the Pacific Ocean have the greater sanitary problem to face. That ocean being wider than is the Atlantic Ocean, the voyages are longer and the difficulties are increased thereby. Consequently I have chosen a Pacific vessel to illustrate what I may have to say with reference to the sanitary conduct of an ocean liner. The sanitary system is patterned after the best hotels and public buildings. 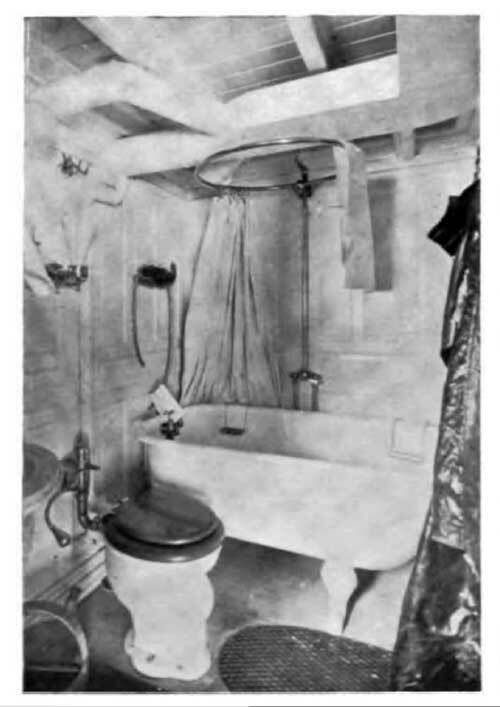 Our lavatories and baths are all mechanically ventilated and are fitted with the Watrous aqua meters, Lucania and Cairo bowls, and enameled iron bath tubs. The piping system is of the usual water trap system, and the flushing of the mains is under a pressure of forty pounds per square inch. Sea water is used for all flushing purposes. The lavatories and bathrooms are steel lined, and the floors laid with cement and vitrified tiling, which insures against absorption of moisture from leakage of pipes or decks. During the five years of service, we have had but few complaints of any obnoxious odors. 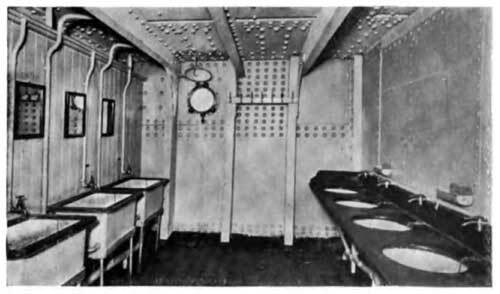 The Chinese crew's quarters are arranged with lavatory tanks which are of the continuous flushing system, and are always free from overflow, and have always worked satisfactorily. For the medical and sanitary care of our passengers, will say that we have had but two cases of malignant diseases. With the ordinary cases of sickness our passengers remain in their quarters. The staterooms are perfectly ventilated, both natural and mechanical. 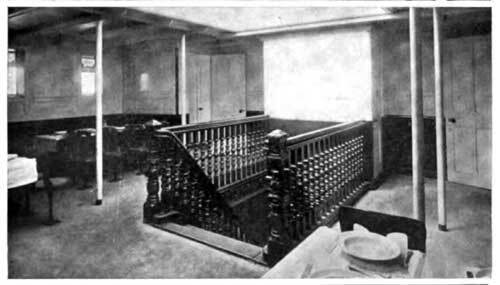 If the sickness is of a contagious nature we use the hospital in the after part of the ship and on the main deck. The most of our sickness is among the Chinese passengers and crew. We carry one surgeon who is supplied with the necessary drugs and tools for most any kind of work in the medical line. The vessel is 630 feet long, 731 feet in beam, and 56 feet deep from the keel to saloon deck amidships. Add to this the various decks and the height to the upper navigation bridge is 88 feet 4 inches. The total deadweight capacity is 23,000 long tons in addition to the weight of the stores and equipment, while the vessel has a cubical capacity of 28,000 tons of 40 cubic feet, available for the stowage of light cargo. The vessel accommodates 318 cabin passengers, 1,500 troops or Asiatic steerage, and a crew of 250. 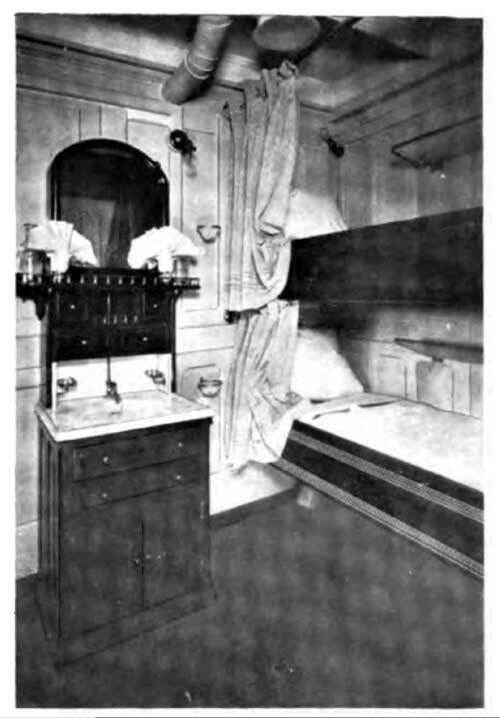 The fittings include bilge keels, double bottoms, twenty-six watertight compartments, water and sulphur fumes, fire-extinguishing apparatus, all the usual safety appliances, suites de luxe (not illustrated) and finished in mahogany, and with elaborate fittings, elaborate staterooms with running water, telephone, electric heating and lighting, mechanical ventilation, and every luxury; the dining saloon, music room, library, smoking room, nursery, and other public quarters are finished with little regard to expense; food inspection, laundering, and the sanitary quarters are under expert care. 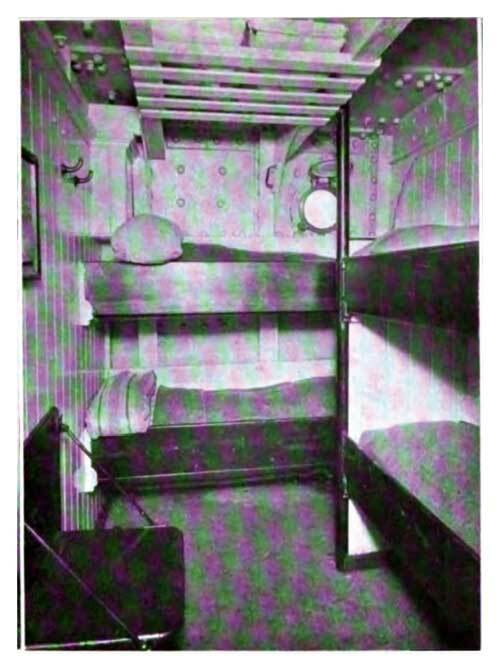 It stands to reason that the cabin accommodations of such a vessel would be sanitary, but what are equivalent to what is commonly called "steerage” is called "third cabin" on this vessel, and the third-class passengers have staterooms on the main deck forward. These quarters are good, although there are three to five berths in each stateroom, and they are separate from the Asiatic steerage. This latter does not depend upon hatches for ventilation, carries Japanese and Chinese cooks, and is obliged to supply an opium den. The vessels of this line follow the Japan Current and require about fifteen days to sail from Seattle to Yokahoma and then proceed to Kobe, Nagasaki, Shanghai, and Hong Kong. A round trip to Hong Kong takes about seventy days, allowing about a month ashore at various ports of call. In looking over the crack steamships coming into New York harbor, one cannot but be impressed with the sumptuous and sanitary quarters for first and second cabin passengers, but some of the older of these same vessels have wretched steerage accommodations, with open berth sections, and not nearly so good as those upon the Minnesota, already described. 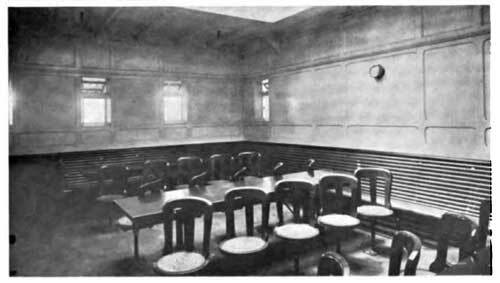 However, the bad features of “steerage” quarters are in process of elimination by business competition. 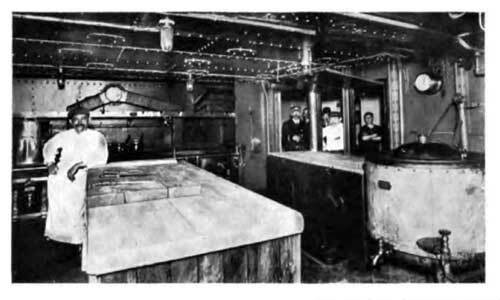 It is easy to assail the so-called “trust," but it is the “International Mercantile Marine Co.," known as the “steamship trust," that improving "steerage" quarters. They are the people who had the merry rate war with the Cunard Steamship Co., and control the White Star Line, International Navigation Co. (American and Red Star Lines), Leyland Line, Atlantic Transport Co., Dominion Line, and National Line. They also have traffic agreements with other lines. 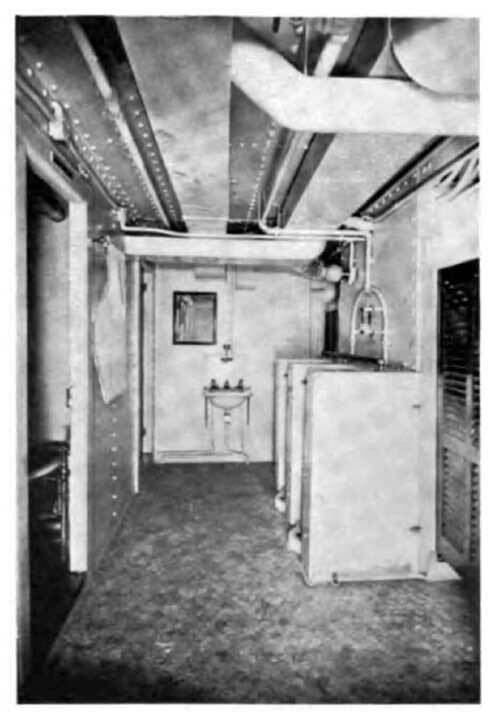 I spent some time at their offices at 9 Broadway, and was shown many things of interest, but what impressed me m06t was that the sanitary problem is appreciated by a trust (as I have found in other directions), and their very latest 1909 vessel, the S.S. Lapland, has modern quarters for steerage passengers. 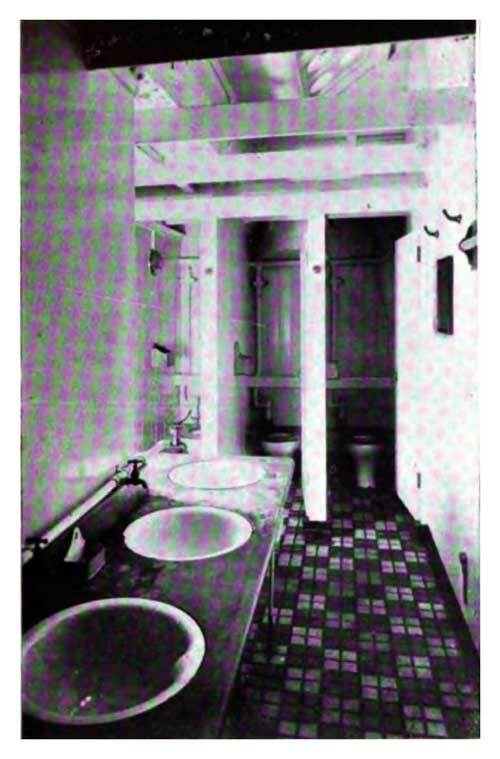 Two illustrations of this vessel are given; the galley and the washroom construction for the steerage passengers. This vessel carries 400 each of first and second cabin passengers, and 1,800 third cabin or steerage. It is of 18,694 gross tonnage, is 620 feet long, 70 feet beam, and 50 feet deep. It is a model of sanitation. But the most interesting thing of all is the “Gothland." This Red Star liner is the “Gothic" of the Australian and New Zealand service, but rebuilt and renamed. She is a very good ship, of 7,736 tons gross, 504 feet long, 53 3-10 beam, and 37 deep. The vessel accommodates a total of 2,100 passengers, all third class, and sails between New York and Antwerp at a rate of at least sixteen miles an hour. The accompanying photographs show how well the vessel is equipped. 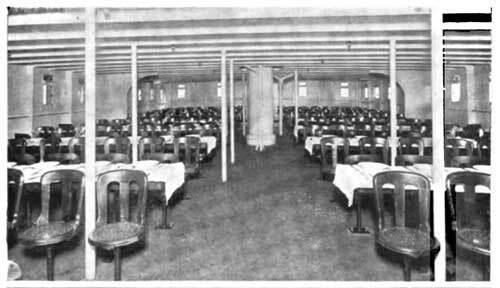 All of the decks usually accorded to passengers are available to these “steerage" passengers, and they have perfectly sanitary and comfortable quarters. This is a step in the right direction, and it is to be hoped that other lines will be forced to follow the example. In this boat, married couples have entire privacy, while other staterooms are of a size for a family. 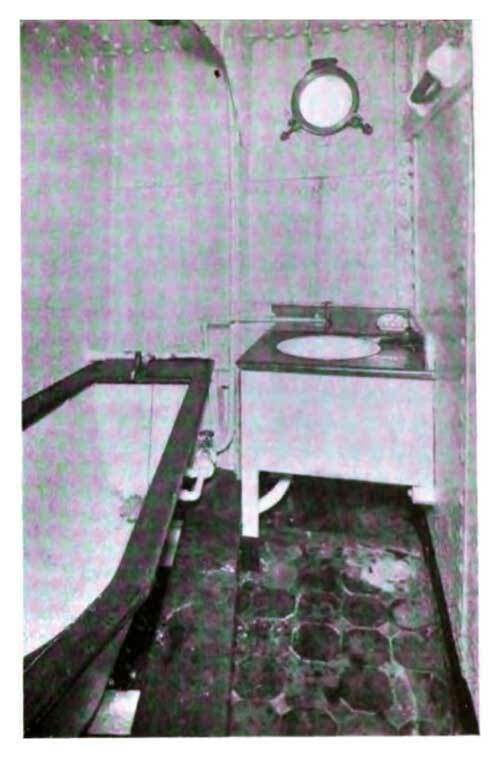 There are many problems involved in the sanitation of ships that are discussed in the chapter upon Ie Army and Navy Hygiene," and it is suggested that the reader consult that chapter for further details. A few words must be said about marine freights. In the days of leaky old wooden sailing vessels, there was much insanitary freight. But nearly all long voyages are now made under steam. In temperate and in northern waters there is very little cause for complaint, but in the tropics some merchandise becomes most insanitary. This is particularly true of hides and bones from Argentina. 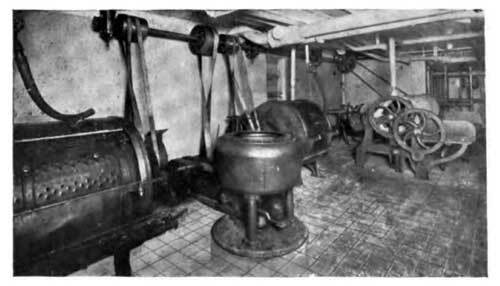 Some of the vessels so loaded become swarming with maggots and the decks must be constantly washed free of them. Our southern ports must keep a constant lookout for insanitary cargoes. We American$ are charged with packing our goods very poorly. That does not do aboard ship. Doubtless, there are still many insanitary cargoes and poor quarters for crews of freighters, but conditions are improving as construction is advancing. I have beard many people tell of the awful conditions “before the mast," but they get their ideas from fiction. I have been aboard many freighters and “tramp steamers," and have seen some conditions far from ideal, but they are not half so bad as the novelists would have us believe.